As a man who eats meat, and always has, I’ve never been in the position to take the moral high ground as far as dinner table ethics are concerned. I do, however, respect peoples’ choice to follow vegetarian diets, and understand that vegetarian food is not necessarily boring food. Alas, it is only within the past five years that so many British restaurants have begun to understand the true, delicious potential of vegetables. Until recently, most token vegetarian dishes would consist of some astoundingly grim incarnation of mushroom, halloumi, or indeed both. Not to mention tofu that turns to flavourless gum in inexperienced hands. As a result, it was once incredibly difficult to find truly exciting meat-free food when eating out. First launched in Hammersmith, The Gate, however, has been operating for over twenty-seven years, and is one of few restaurants to have gained a solid reputation for an exclusively meat-free menu before the turn of the century. 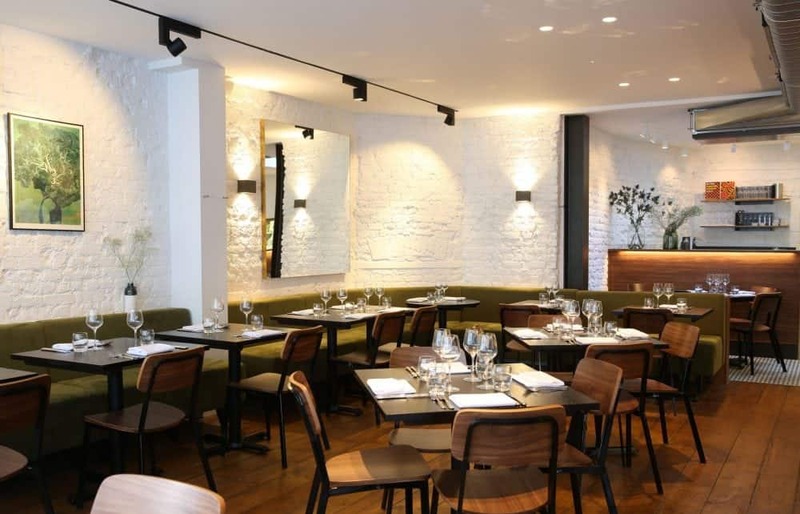 Twenty-three years later, another branch opened on Islington’s St. John Street, and at the end of 2016 a third outpost opened. The latest outpost is on Seymour Place, just behind Edgware Road, and is bright and welcoming, split between two levels. During a Wednesday evening visit in the middle of January, what’s most surprising is how busy the new restaurant is. But it’s hardly surprising given that so many of us are now conscious of the produce we’re eating. Vegan food sales, alone, even increased by 1500 per-cent last year. Posing a menu without a single trace of meat or fish, most dishes are also available with a vegan or gluten-free option. Following a round of jalapeño margaritas with enough acidity to work up a real appetite, we start with three lentil pate terrine and couscous fritters. Pastes of red lentil enhanced with smoked paprika and tomato, basil-laced green lentil and beluga lentil with olive are pressed into a pretty-looking slab – like Neapolitan ice cream with a natural palette. The green and beluga pairings work delightfully well together, with a stark contrast between sweet basil and umami olive. The red lentil counterpart is fine, too, though best alone with the accompanying slices of toast. Couscous fritters are a loving nod to Moroccan cuisine, albeit modernised. Here, four golf balls of breaded and fried couscous are subtly spiced and laced with feta cheese possessing enough lactic acid to cut through any residual grease from the fryer. 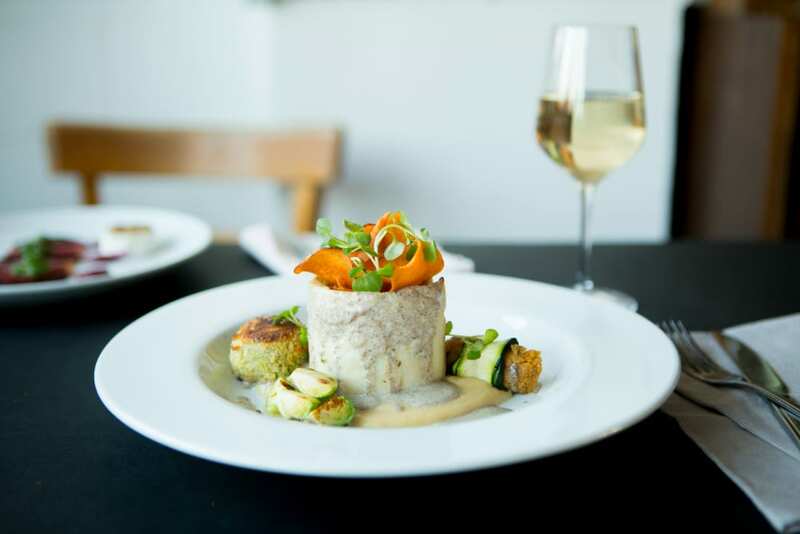 A main course of butternut rotollo is a complex dish, with a mound of sage-infused potato surrounding an earthy mushroom duxelle and chestnut and pistachio sphere of stuffing. Strangely enough, these contrasting flavours all work in harmony, while a scattering of parsnip crisps adds a pleasant level of texture. Accompanying maple parsnip puree, however, is overly sweet, while raw apple and bitter leaf salad is so unwelcome that it seems to have fallen on to the plate from a completely different dish. On the other side of the table, The Gate’s take on schnitzel favours trendy aubergine over flattened meat that’s often overcooked to the point of dryness. In addition, the plate is also dressed with smoked cheddar plus basil pesto, tomatoes and roasted red peppers to compliment the sweetness of the aubergine – making for an enjoyable, flesh-free riff on the Central European classic. The aubergine schnitzel is so good, in fact, that it makes the prolonged wait between courses far easier to forgive. On the other hand, polenta fries served at The Gate are astounding, but the choice to serve them in a miniature chip pan (possibly bought from Tiger) is far more difficult to let go. To finish, a wedge of vegan cheesecake is unexpectedly the best thing eaten here. Substituting cheese for a paste of fatty cashew nuts, the ‘cheese’ element of the dish has a surprisingly desirable texture, while some tart cranberry jam is on hand to cut through the fattiness. What’s more, the restaurant’s bar also serves an impressive selection of digestifs: the outstandingly moderate pricing of rare Yamazaki 12 year-old Japanese whisky, for instance, must be taken advantage of before stocks deplete entirely. In addition to serving a selection of well-executed dishes, the latest opening of The Gate continues to prove that vegetarian food needn’t be unexciting. The Gate Seymour Place can be found at 22-24 Seymour Place, London, W1H 7NL. Next PostAre Brits actually starting to cook?